There’s always something new to eat and drink in Hong Kong, and this week is no exception. Art Month is going strong, and Zuma is responding with new art-inspired cocktails and food offerings. Elsewhere, Pica Pica has a launched a Spanish Sunday brunch for your next big group gathering. Last but not least, the mighty French Dip sandwich is landing with a bang at Hunter & The Chase this month. Load up on this superlative feat of sandwich engineering plus more in this week’s New Eats. The award-winning bar team at Zuma Hong Kong (led by Adam Hrapko and Nariman Abdullayev) are diligently at work again on a new cocktail menu, this time inspired by the Japanese tradition of Hatsuyume, which refers to the first dream one has in the new year. In conjunction with illustrator Nic Rouge and floral artisan Kirk Cheng, the sixth-floor bar has been transformed by décor including a wisteria floral installation in celebration of Hong Kong Art Month, with new cocktails drawing from the auspicious symbols related to Hatsuyume, including Mount Fuji, an eggplant and a hawk. The Nasu (HK$120) features charcoal eggplant-infused vodka, with homemade Japanese marmalade and sage for an herbal kick; while Tabako (HK$120) is a mix of Johnnie Walker, Aperol, yuzu hibiscus, pineapple and smoked coconut ice. 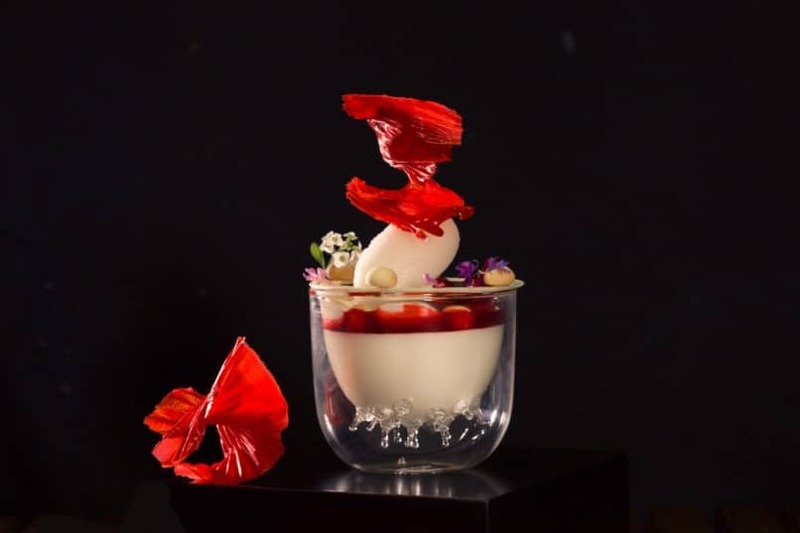 To pair alongside the art-inspired cocktail menu, fresh new dishes for spring have been engineered by Executive Chef Oscar Luzon de Arcos, with a focus on new imported seasonal ingredients. The truffle and ama ebi su meshi with sea urchin and caviar (HK$350) references the artistry and mastery of esoteric Japanese ingredients Zuma is renowned for; while smoked shima aji with green apple and kizami wasabi showcases the seasonal ingredient with a theatrical twist. For dessert, Asia Executive Pastry Chef Eddy Lee continues Zuma’s creative streak in the sweets department with a new silky steamed soya milk tofu topped with fresh wild strawberries and sudachi sorbet (HK$145, pictured above) — a stunning palate cleanser which should delight the art crowds descending this month. If there’s one thing American diner food inspires, it’s gleeful excess. This is the manifesto of the new American Bistro Nights at Hunter & The Chase: Every Tuesday, the gut-busting numbers from hot dogs to pastrami sandwiches are set to double in size, providing both Insta-bait and dinner for two (or three). The monstrous new creations include the Chase Double Beef Burger ($208), bearing four thick patties layered with crispy bacon and draped with cheddar cheese; and the Big City Red Hotdog (HK$128) stuffed with two giant beef sausages in place of one, smothered in a house relish. The triple-decker threats continue with the succulent Roast Beef French Dip Sandwich (HK$148) with endless layers of thinly sliced beef; and the Pastrami French Dip Sandwich (HK$148), an ambitious stacking of cured and smoked beef, pickles and mustard. 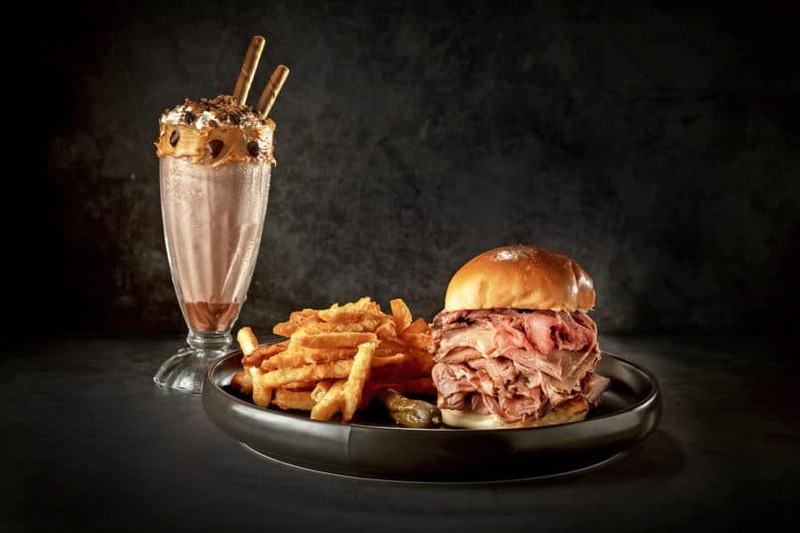 And in case the oversized portions aren’t enough for you, the ‘thickshakes’ now come with the option of spiking with your favourite spirit (add HK$40). American Bistro Nights start at 6pm every Tuesday. Embracing the lively spirit and tradition of Spanish fiestas, hot new tapas bar Pica Pica has launched its brunch offering, helmed by the talented chef Edgar Sanuy. 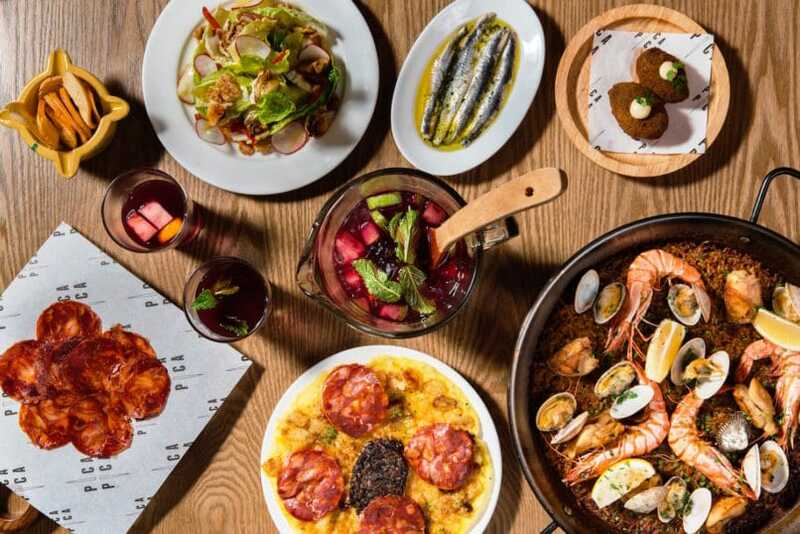 The cosy tapas bar steps into the Hong Kong brunch scene with a fantastic semi-buffet spread abundant with quintessential Spanish tapas: think fluffy omelettes, an array of cold cuts and house-cured seafood, vibrant salads, and freshly made pastries. Made-to-order small plates include the golden croquettes oozing with ham and cheese, crisp bikini sandwiches smeared with black truffle pâté, and weekly changing roasted meats, from Ibérico pork to lamb neck. Brunch-goers can cap off the decadent meal with a 2-hour free-flow package inclusive of house-aged sangria, Cava, select red and white wines, draught beer, cocktails and more. The semi-buffet is priced at HK$310 per person, plus HK$260 for free-flow.